He's not as hyped as Stephen Strasburg , but Toronto Blue Jays righty Kyle Drabek will make his Major League debut tonight against the Baltimore Orioles. Drabek is the son of former Major Leaguer Doug Drabek. The younger Drabek has been considered one of the top pitcher prospects in the minors. He was the Phillies first-round draft pick in 2006. The Phillies thought last season wouldn't it be cool if we had Roy Halladay instead and they shipped off Drabek to the Blue Jays this offseason. 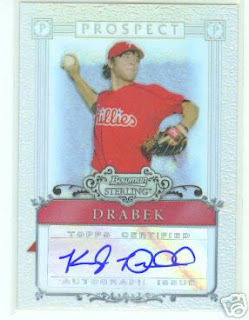 If Drabek had stayed with the Phillies, it's a wonder if he would have gotten the opportunity to pitch this year. When Philadelphia had issues with Kyle Kendrick and J.A. Happ being injured, I would think they would have given him a shot. He really could not have done any worse than Kendrick. Instead, we had to wait until Sept. 15, with less than three weeks left in the regular season, to see what Drabek has to offer. I'm rooting for him. I got to talk to him for a minute when the New Hampshire Fisher Cats were in Trenton earlier this summer. He seemed like a very down-to-earth guy. Not a bad debut. He got hit a bit & had some nice defence behind him - but overall the kid did alright for himself. Jays offence was especially terrible tonight. But don't get me wrong...still miss the guy with the red beard.